A few weeks ago, a producer from Iowa Public Radio asked me to participate in a show about adult twins. She was doing a feature about the pair of identical-twin brothers who won the most-identical-looking-twins contest for adults over 18 years old at the Iowa State Fair. The producer, a fraternal twin herself, interviewed the 32-year-old brothers about their twin experiences. Both men are teachers and coaches at the same high school. They live close to one another and both are married with families. They appear to be very close, compatible, and secure in their individual and twin identities. They seem to share that twin synergy—the feeling that the presence of the other brings enjoyment, predictability, and harmony. One of the twins remarked how gratifying it is to coach football with his brother because their compatible styles and strategies make sharing the experience doubly rewarding. The second half of the show was devoted to call-ins. Interestingly enough, all of the callers were male. Three were adult twins and the fourth was the father of fraternal twin girls. I was particularly struck by the call from a gentleman named Andy. He described his struggles in high school with being identified as Amy’s twin brother. Amy happened to be one of the school’s outstanding athletes. When it came time to apply to college, Andy told Amy that he felt it was imperative that he attend a separate university because he needed to establish his own identity. Although Amy was disappointed that they would not be together, she reassured Andy that she understood. Andy said that his college experience helped solidify his identity. He and Amy have a wonderful relationship to this very day. 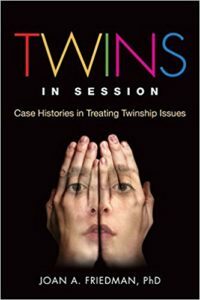 Having the ability to talk to one another openly and honestly about their feelings as teenagers enabled them to cherish the twin attachment and respect the need for autonomy and individuation. 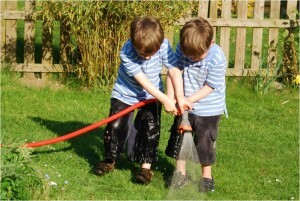 Some twin pairs feel inhibited about sharing such needs because they worry that their twin will feel betrayed, abandoned, or disappointed. Stories like Andy and Amy’s show that it’s worth the risk to communicate openly.